Valorie sewed her strip pieces, cut strips apart by anglinig her ruler, then rearranged pieces to create an improv design. Her trick or recommendation is to take a photo when you like your improv design to refer to in the sewing process. Valorie's finished quilt utilizing improv piecing. Click here for Valorie's tutorial from this demonstration. Johnnie described frustrations we all face in piecing. We can sew two exact same fabric pieces together but when finished the blocks are different sizes. Why is that? Johnnie provided many insights and proven techniques for overcoming these sewing dilemmas such as iron the pieces the exact same, use an 80 weight thread, for better consistency and visibility use moleskin to mark 1/4 line on machine. 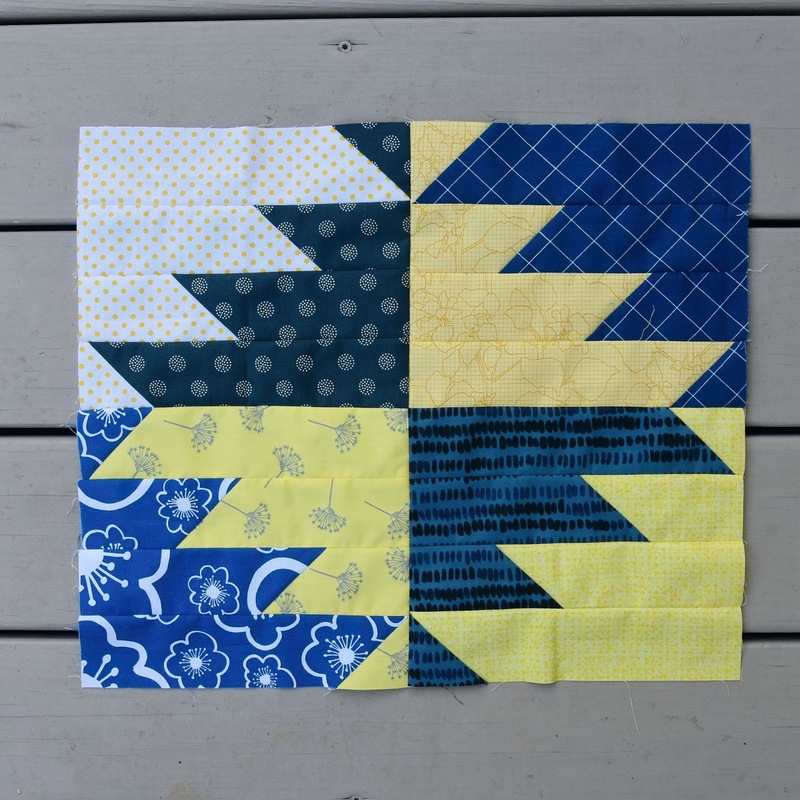 Click here to see Johnnie's recommended tutorials for Accurate piecing. 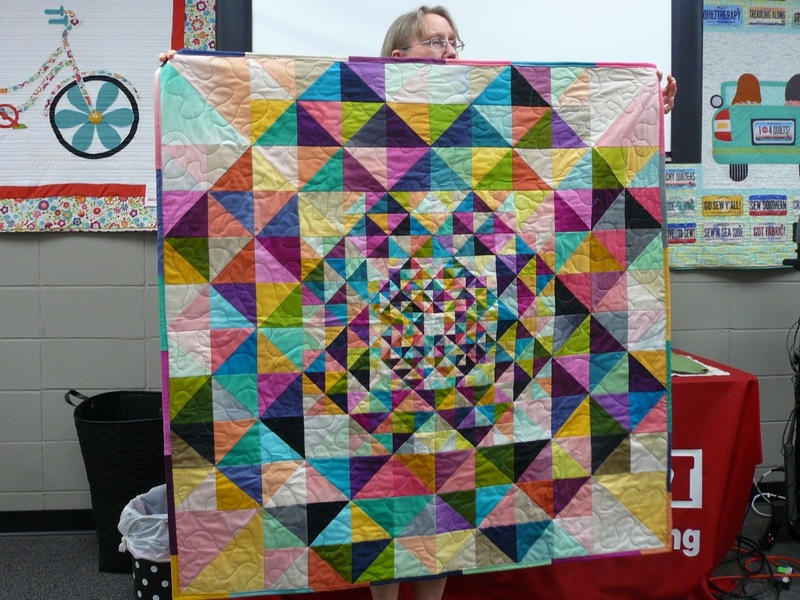 Congratulations to our fellow GMQG Quilters who participated in recent quilt shows and won awards. We applaud you!!!! GMQG now has a library!!!! Paige Alexander entered our group in a contest drawing announced by Susan Woods, Editor at Lucky Spool Media to win several of their publish books. And, we are the winning recipients. Many thanks to Susan and Lucky Spool Media. It was wonderful to see the many new faces this past Saturday. Sandy Helsel reported we had 8 guests in attendance. We appreciate you coming and joining in with us. We had a total of 36 present. Thank you Paige Alexander for the quarterly financial update. She also announced our MQG dues for 2018 will remain the same at $35.00. She will be receiving your renewal dues and/or if you would like to become a new member next month either by CASH or CHECK. Bernina Sewing Center. It is a relaxed, informal sewing time with lots of opportunity to visit. You can choose to bring your lunch or order with the group. For those attending, Cindy asks that you purchase a 1/2 yd of fabric at Bernina to contribute to the grand drawing where one lucky person wins it all!! Save the date: NOV. 11th our very own, Michele Blake will be our program guest speaker and workshop host. Reminder note: Our meeting will begin at 12pm which will include our Guild Business, Show & Share and Michele's bag making tips. Then following, for those that signed up, Michele will be teaching a Zipper Bag Workshop. If you are interested in the workshop, contact Cindy at cindy@hyacinthquiltdesigns.com *Note: For those attending the workshop, please click here for Michele's supply list. Cobblestone Quilt Guild is hosting a workshop for "Introduction to Quilt Judging". It will by taught by certified judges Lorraine Covington & Kate Eelkema of the National Association of Certified Quilt Judging on November 10th and 11th. Save the Date: NC Quilt Symposium 2018 is going to be held at University of North Carolina - Asheville May 31, June 1-3. 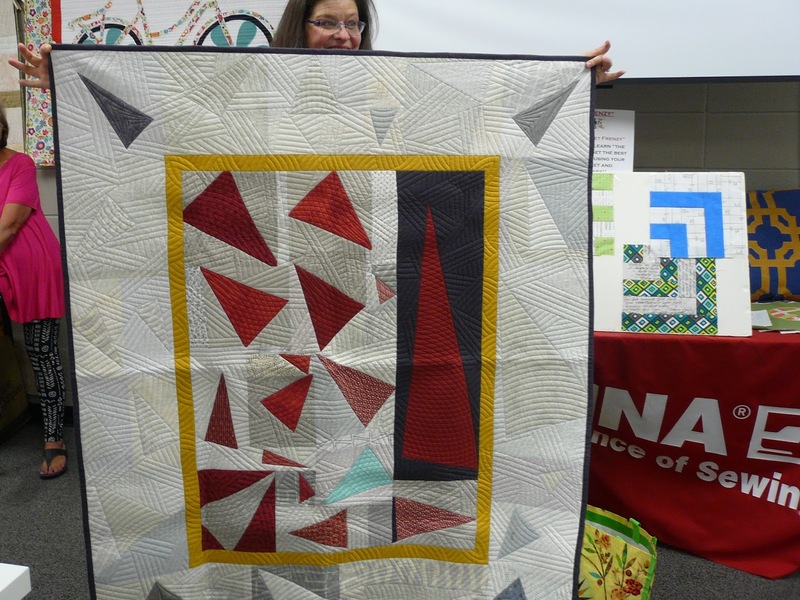 Quilt entries and registration are now open for QuiltCon 2018 coming up February 22-25th. "Fresh Quilting", the MQG show is airing on our local PBS channel on Fridays at 6 am and noon. Those who participated should be commended. They look FANASTIC!!! They each complement Cheryl's sampler above so well. 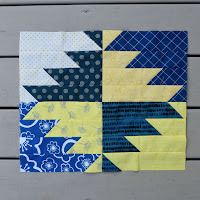 This grouping of blocks will look so pretty in a quilt. It will be fun to see in the future! This month we will be supporting the Las Vegas MQG in their efforts to provide quilts to the victims and first responders involved recently in the concert mass shooting. Both Cindy and Faye have come up with a plan and need our quick participation in contributing quilt squares by Sew-in Day, this Friday, October 20th at Bernina Sewing Center. Cindy will be quilting the piece and Faye will sew binding. Can we do it? From what our group has proven from past "special project" quilts, "YES, WE CAN"
The finished blocks can be mailed to Cindy Lammon (contact her cindy@hyacinthquiltdesigns.com ) or dropped off at Bernina on or before Friday's Sew-in Day, October 20th. Thanks. Did you count.....We had nine (9) quilts donated this month for the Julie Valentine Center. Just AMAZING!!! Your ministry may not be evidenced directly, but if the response from our group in seeing your quilt, this past Saturday, is any indication, you can know a young heart will be blessed. Faye was so elated and wanted to convey her heartfelt thanks to each of you. I would describe this months Show & Share in one word: "Dazzle". Dazzle because as you will see below each quilt "delighted the eyes" with creativity and color. 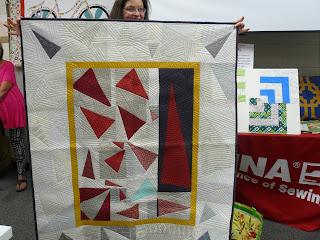 Valorie Kasten - Her quilt from a Denise Schmidt's class at QuiltCon 2017 called "Veronica's Paper Airplanes"